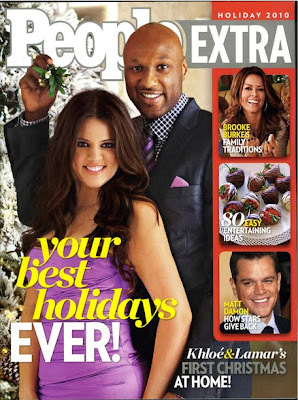 TweetIt may not be on the racks yet, but it will be soon... and thanks to the Kardashian's loving to blog, we've got a sneak preview of People's Holiday issue which will feature Khloe Kardashian and Lamar Odom on the cover. I've always questioned their relationship and been waiting for the day that they break up, but to be honest- I think each episode and picture that I see pushes my "estimated date" back a little further. They're actually pretty darn cute together. I definitely think Khloe received the extreme short end of the stick when it comes to attractiveness in the Kardashian family, but there's something about her and Lamar being all happy together that makes her a little more attractive. And while we're on the topic of the Kardashian clan- have you seen the pictures of Khloe, Kendall and Kylie at the Burlesque premiere?! Kendall is gorgeous! Kylie's got something weird going on with her smile, but they seem to have gotten the good genes! Now if they can find a happy medium between the scary skinny that they are and the too-much-goodies of their older sisters within the next 4 years [when Kendall's 18], we might have to countdown to their legality.